We really should learn, but we don't. No matter how often we are reminded. Twenty-four hours - indeed the hour and a half of a race (though in this peculiar case you can add close to an hour's delay from a red flag on the top of it) - is a long time in F1. And another thing that we keep forgetting is that whatever happens in practice and qualifying - however extreme, whatever their apparent importance - exactly no points are handed out until the chequered flag falls. And so it was at Silverstone. How different was the Lewis Hamilton of after qualifying and after the race. In the former, having thrown away what looked a pole position his by right through nothing other than a gross personal miscalculation, facing a seemingly decisive five-place starting deficit to his team mate and championship antagonist Nico Rosberg, seemingly extending a periodic spell wherein little would go right for him, he was bewildered, uncommunicative, almost shell-shocked. Aptly he noted later that his 'world was crumbling beneath' him. But twenty-four hours on Lewis was barely recgonisable. All smiles and radiated glee, proudly sitting next to his earned gold trophy put on full display, as he had the post-podium press conference eating out of his hand. Relaxed, content, cracking jokes about among other things the structural integrity of the Santander trophy he'd been handed on the podium itself, that he reckoned had cost about £10 (F1's equivalent of middle class problems clearly). What had changed? Twenty-five points had changed of course. Lewis had won his home race, and even better as far as he was concerned Nico didn't make it to the end. The Englishman insisted afterwards he regretted not being able to battle wheel-to-wheel as a result of it, as well as that the win had to come in that form. But presumably he'll have no problem with the points swing. All of the sudden his gap to Nico at the table top has gone from a daunting 29 to a doddling four. Really in the end it all comes down to results, and perhaps we're guilty to extrapolating everything back - imaginary or real - from such outcomes. If outcomes aren't as expected all sorts of supposed problems are mooted, sometimes born of amateur psychology - with Lewis it seems more prone than most to receiving such treatment. Sure enough on Sunday morning post-qualifying and all that there were plenty of newspaper banner headlines referring to Lewis 'cracking up' (gleefully picking up on some words of Jackie Stewart's) and 'sulking' among other things. Yet with equal suddenness if the outcomes are there then as if someone has flicked a switch all seems right with the world. And just as Lewis had to cope with all of the doubts in recent weeks when the results were lacking with his British Grand Prix victory all of Lewis touted problems - 'psychological' and otherwise - immediately seemed a million miles away. Such an attitude perhaps is understandable however as for most of us looking in results are all we have to go on. Really, no matter how well-connected we are (or think we are) almost none of us have an inside track on Lewis's moods or state of mind. Frankly a few are disingenuous in implying that they do. But still, F1 observers are rather like mountain goats - having to make the most of rather meagre sustenance for as long as they possibly can. Lewis's race was likely to pivot on how quickly he could clear the cars between him and his stable mate, and sure enough he set about it right away. Two - Nico Hulkenberg and Sebastian Vettel (in the latter case via some wheel-banging) - were cleared in the opening corners which got him up to fourth, then a first lap red flag and a subsequent safety car re-start partially worked in his favour by hauling Rosberg in ever-so slightly. But still Lewis after the green flag dropped next time around made short work of the two McLarens that separated him from a crack at Nico on the next two consecutive laps, yet even by the time he'd done this Nico - presumably as aware as Lewis that advantage gained at this stage in the race would likely prove crucial - already had five seconds on the other silver car. There roughly the gap stayed for a while, but from lap 10 Hamilton started to eat into it, and by lap 17 the gap was less then three seconds. Come a lap later Nico pitted. Lewis's strategy then entered its next phase, adopting the recent vogue in F1 for 'offsetting'. Rather the opposite of an undercut - but seeking the same reward - with an offset you run longer than an opponent ahead before pitting, hoping to clear them on fresher tyres later. 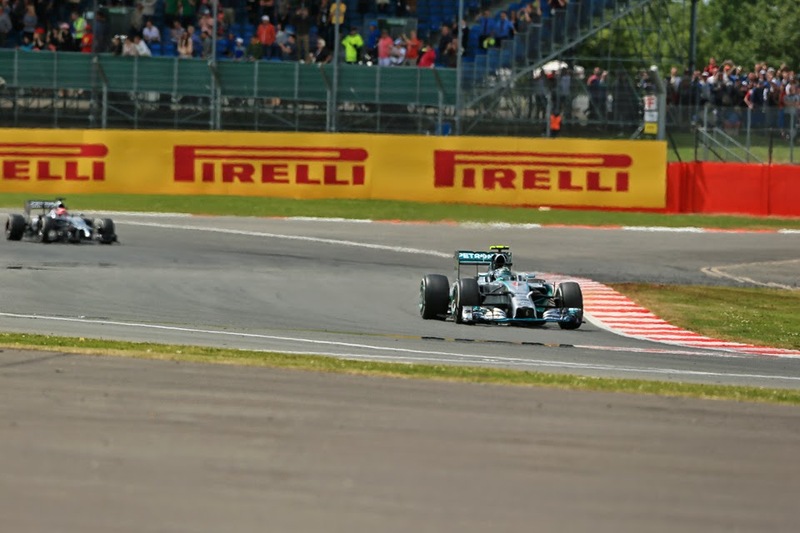 Lewis eventually pitted on lap 24, six laps after Nico, and despite a tardy stop emerged six seconds adrift. But as mentioned on newer rubber, as well as it transpired with a hard compound that was working well in the conditions of race-day (rather against expectations) meaning not only would he have a faster than expected middle stint he also now held an ace up his sleeve of the possibility of doing a one-stopper. Even without these advantages Lewis looked marginally the quicker of the two. Now it seemed the fun would start, but Nico had been reporting a gearbox problem since lap 20, his 'box selecting neutral on the downshift. Lewis whether related to this or not then took massive bites out of his team mate's lead, and come lap 29 the maladies had halted Nico definitively. Thus Lewis - barring unreliability of his own - could not be touched. And he wasn't. Lewis reckoned he'd have won even without the Rosberg's halt. Nico reckoned he'd have won. 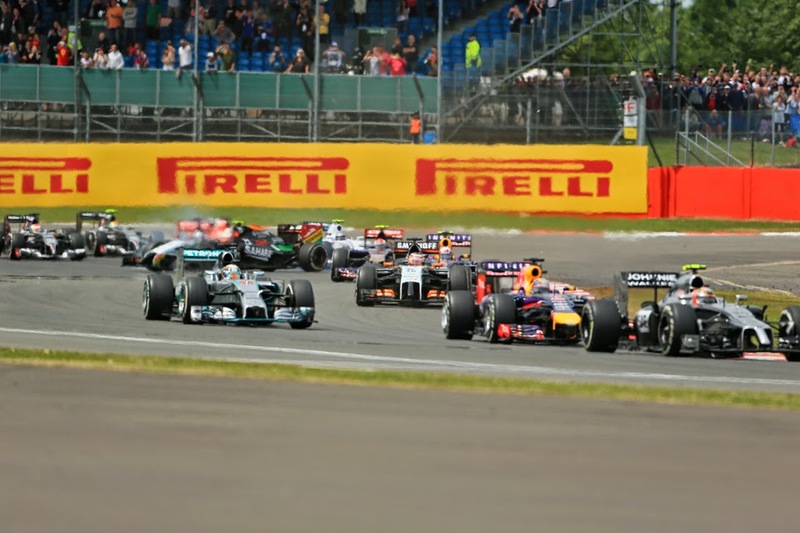 Toto Wolff reckoned the cars would have been together for the final ten laps, with a repeat of the desperate battle of Bahrain and Spain ensuing. But it's a moot point. I am one who doesn't believe that luck necessarily has to level out, not over a season anyway, as well as believes that it's fallacious to talk of a driver being 'due' a mechanical retirement. 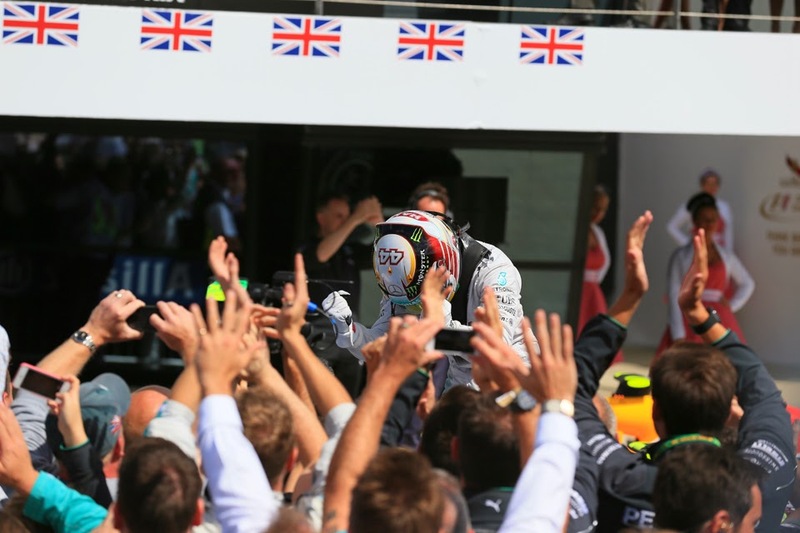 But whatever is the case Lewis all-in probably deserved any luck that he might have had at Silverstone. There was one other big story of the race. Namely that the closeness of the rest to the Mercs of Austria last time out was on Silverstone's evidence rather a flash in the pan. Indeed here the pace advantage of the W05s was as big as we've seen it anywhere - after just fifteen laps of green flag racing the car in P3 was some 30 seconds off the lead. Indeed, even though Lewis cruised from the point that Nico dropped out, and allowed himself a precautionary second tyre stop, by the end his lead was still one of half a minute. Still, as has often been the case this season there was also some fun in the non-Mercedes class. 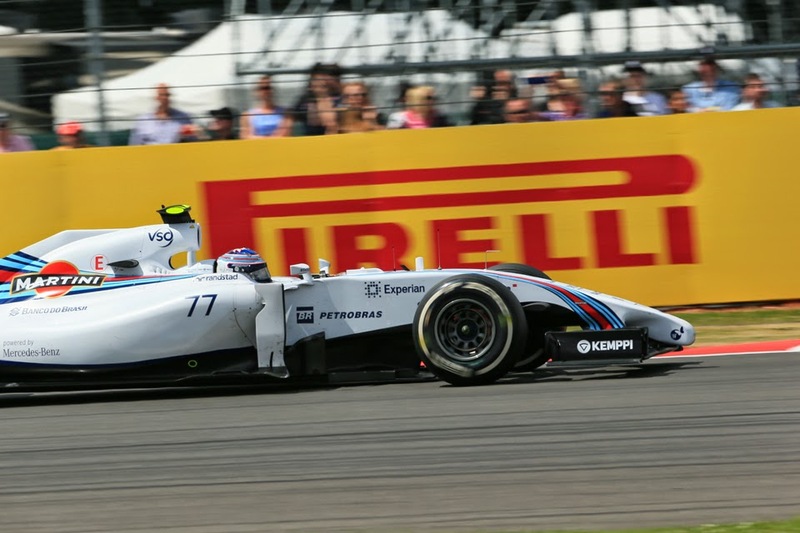 Not least from Valtteri Bottas, who was the star of the non-Merc show. Arguably the star of the show full stop. Somehow he leapt from P14 to P9 on the stand-alone first lap. Then when things re-started he continue in that vein with a robust and rapid drive peppered with wonderful overtakes, including passing either McLaren in turn around the outside of Stowe. By the end he was second, having left all aside from the Mercs far behind. Even though he wasn't as close to the front on the stopwatch as in Austria arguably it was the more worthy result of the two even over and above that this one was done from a lowly starting slot, as while the Red Bull Ring could have been designed for the Williams Silverstone wasn't thought to represent happy hunting ground for the car. I'm usually more reluctant than most to get too excited too quickly about a young driver's potential, but last Sunday Valtteri you convinced me. You'll win titles one day. Daniel Ricciardo was hardly noticed, but as seems to be his way in 2014 he once again put in an excellent drive. This time he was rewarded with P3, after an unlikely one-stopper that only became apparent to him as the race progressed. And his final stint was a marathon, having pitted on lap 15 and from there running all the way to the end without halt. Jenson Button had a similar surprise day. Even after qualifying in third - as usual showing impeccable judgement in wet-dry conditions - he was insistent afterwards that he didn't have the pace in the dry to get his first podium in Britain. 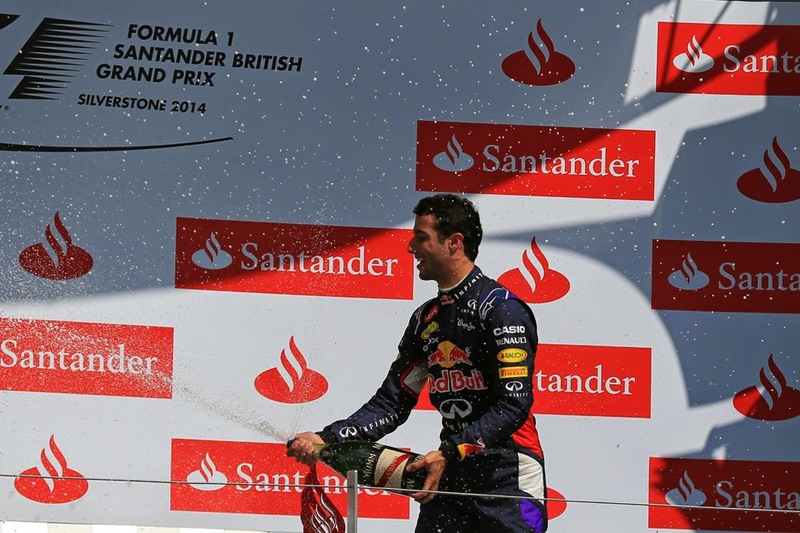 But he very nearly did, finishing less than a second behind Ricciardo after employing a one-stopper of his own. His drive was typically controlled and quick as well as robust in defence when needed. Perhaps he'd have got his podium with an earlier stop. And in the latter part of the race we were treated to one heck of a sideshow. Fernando Alonso (starting P16) was as formidable as always and rose up the order almost as rapidly as did Bottas did; come lap 18 he was hounding Button for fourth place. Things then got more difficult though, due to a combination of losing rear downforce after a stone got lodged in his rear wing, an ERS problem as well as having to save fuel in the latter part of the race. He also got a five second penalty added to his stop after managing to miss his grid slot at the start(! ), as well as found his strategy of ditching the hard tyre at the red flag rather going against him as, as mentioned, that compound worked much better than expected. He still had a trick or two up his sleeve though, as the (unusually and as the man himself admitted afterwards incorrectly) two-stopping Sebastian Vettel emerged from stop two just ahead of him, but Alonso wasn't going to let him get away with it that easily and after some dicing stuck his Ferrari around the outside of the Red Bull at the mighty Copse curve. It was a move - just like the one on Michael Schumacher at 130R all those years ago - that we'll likely forever associate with the great Spaniard. The man himself summed it up on Twitter later: 'Risk = High; Adrenaline = Max; Possibility that I will repeat = unlikely'. The two then for several laps indulged in a frenzied, furious and thrilling scrap, with Vettel seeking to pass the hobbled Alonso at just about every angle, and Alonso as we've grown used to selling his hide as dearly as they come. Moreover that two multiple world champions fought with such extreme desperation, in a season in which their chances of getting big prizes have long gone, and over fifth place, should elicit something like admiration. That the two - if not sworn enemies - probably aren't on each other's Christmas card lists no doubt added to the intensity. It was spoiled ever so slightly by the TV feed letting us listen into the two complaining about the other; rather incongruous with the classic nature of the fight that could be viewed from the exterior. Both protested that the other exceeded track limits - and both had a point. Seb though also complained about Alonso's driving, that he wasn't being given space, and what his beef was based on here was about as hard to penetrate as Alonso's defence. Alonso was robust yes, but I never saw anything unfair, nor as far as I'm aware did anyone other than Seb. 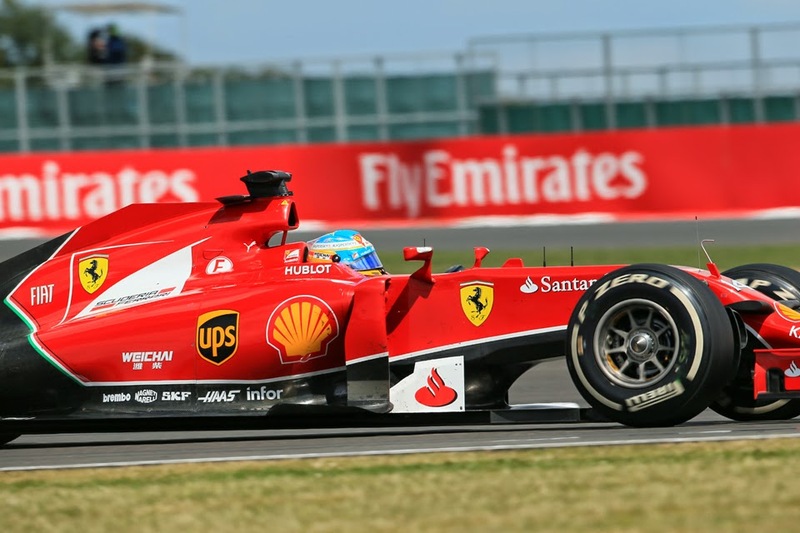 And quite why Vettel expected anything other than a difficult task is anyone's guess. Vettel eventually made it through and left Alonso far behind, a fact that underlined just how effective Alonso's rearguard had been. But in terms of the main story it was all about Lewis's redemption, and in so doing not only sending most of the assembled hordes home happy but also giving us a very different title picture. 'We'll draw a line under that last nine races and now it’s attack mode, start again and now, utilising that pace and utilising the car's pace' Lewis added after the event. Somehow you struggle to doubt him on that one. Particularly as a few circuits on which Lewis specialises await. But then again, to return to where we came in, an hour and a half of a race is a long time in F1, and with by the team's admission the Mercedes reliability far from perfect there no doubt will be a few more grand shifts - in either direction possibly - to come. Thus it's probably not all that smart for us to try to look too far ahead. That's another bit we shouldn't forget.